The problem here is that not only are VR and AR experiences things that are best shown by first-hand demonstration, but they are experiences that most people have no baseline to extrapolate from to even imagine what the experience might be like. The closest most people have come to Virtual Reality are 3D movies or Wii’s motion controls – and those are so far removed from VR that they aren’t even reasonable comparisons. One way Samsung has tried to deal with this is to try to use that unknown as its actual selling point. In their “Unwrap the Feels” ad they’ve gone so far as to not show a single bit of the actual first-hand virtual reality experience, but instead they’ve focused on using pure emotional response as the way to sell the product. As you can see in the commercial, not once do we see what the person sees. Instead we see how a person looks using the Gear VR. And as someone who has a Gear VR and has made my family and friends try it out, what you see here is pretty darn close to what you see in reality. And once someone sees another person using the VR kit, usually that person wants to be next in line to try it out – so the approach here could work. But does it really do enough to justify the price of entry? After all, Gear VR only works with specific Samsung phones (which are expensive in their own right), costs an extra $100, and (to be honest) isn’t all that amazing once you’ve used it for a while. Which brings us to the biggest question: How do you sell a “real” VR experience? How do you get products like the HTC Vive, Oculus Rift + Touch or PlayStation VR to start to be things the general public wants to invest their money in? Unlike the Gear VR, these systems sell for big bucks (the cheapest you’ll get is the PlayStation VR, and all-in that’s going to run you nearly $800 … if you can even find one). Do commercials showing people looking scared or awed do enough to get your average consumer to want to take the plunge? In my opinion, the only way VR and AR (at least of the level of HoloLens) are going to take off is through actual hands-on experience. That means getting peoples’ hands on these things to really see what they can do. Honestly it’s the way that Samsung got me to want to switch from Motorola. They had a demo of Gear VR at Best Buy, and I got to actually try it. But I’m not seeing any demo systems of Vive, Oculus Rift or PlayStation 4 out there. Sure, there are videos and pictures up of them at my local stores – but no actual demo units. Best Buy does have a Rift in a glass case, so you can see it. But you can’t do anything with it. You can’t feel how much it weighs to see if you think you’d be comfortable wearing it, and even worse you can’t strap it to your head to give it a test-drive. And that’s what HTC, Oculus and PlayStation need to do: they need to get things out there for people to test-drive. They need to let people actually try the experiences and experience the awe and wonder and excitement first-hand. 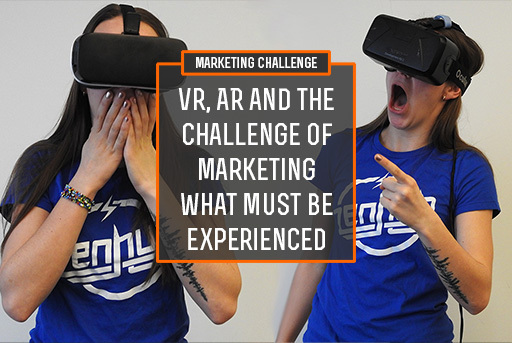 The commercials online or on TV are great ways to maybe build some initial curiosity, but until customers get to really step into virtual or augmented worlds, they’re frankly not going to understand what these things are capable of. For all the concerns about showrooming when it comes to e-commerce vs. brick and mortar, tech like VR and AR (and even 4K television) is the perfect opportunity for retailers to start sell experiential space to companies. As technology moves beyond our smart phone, and into wearables, Internet of Things and new experiences of reality, vision and audio, it’s more important now than ever to use real estate to set the hook for selling a product. Thankfully stores like Best Buy seem to be getting this. Over the last few years I’ve seen my local Best Buy drop most of the shelves of product and instead focus on in-store displays and demos. What’s unfortunate though is how many of these demos are hands-off. Kiosks of videos or products locked in glass cases don’t do much more to sell a product than a video on YouTube. And don’t even get me started on the lack of knowledge the salespeople have on the products. What we need to start seeing is stores set up as experience showcases, with knowledgeable experienced staff on-site (preferably employed by the manufacturer or their marketing firm), and inventory stored in the back for when people do want to make a purchase. I’ll admit, it does harken back a bit in time to people at the State Fair demoing the chopping abilities of their mixers – but there’s so much more now that can be done. Leave the one-way demos online and on TV – but take advantage of the one thing physical locations allow that nothing else does – actual interaction. When I was a kid, I begged my parents for an Atari. And we almost bought one. What we ended up with was something new and even cooler called a Nintendo Entertainment System. And the reason we got that Nintendo was because of this every reason. The store we went to get the Atari had a Nintendo out that you could not only see, but actually play – and it that was an experience unlike anything my family or I had ever had before. Yes, in time we probably would have gotten one anyway after all my friends did. But at the time we bought a Nintendo. We bought it because we got to try it first-hand and experience just how awesome it was. We need more of that. More experiences in our marketing. And not the generic “customer experience” or a load of gimmicks – but actual hands-on experience to let us be wowed enough to hand over our money for more. P.S. With the three major competing VR platforms out there, people like me are going to be stuck in a state of paralysis. Especially without being able to try any of them. I’ve heard the Vive is best. I’ve heard Oculus Rift has the best library. And I know PlayStation is somewhat affordable since I already have a PS4. But dropping a few hundred to thousands of dollars based on what I’ve read online isn’t an easy decision to make. How do I know I’m buying the one I like best if I can’t even try them out?